FEW ONLY AT THIS PRICE! 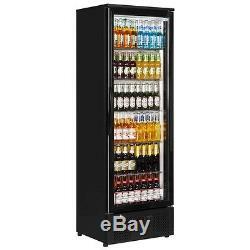 PD110T TALL BACK BAR COOLER. This is a TOP OF THE RANGE BACK BAR COOLER! Please CHECK PRIOR to ORDER!! CALL OUR HELPLINE: 07836 225931. TWIN SIDE Interior LED Light and FIVE shelves , 13 amp. FULLY AUTOMATIC, FAN ASSISTED COOLING, 5 ADJUSTABLE CHROME SHELVES , CAN BE BOXED IN AS FRONT VENTILATED, ADJUSTABLE FEET... OPERATES AT A LOW, 0 oC / +10 oC on Adjustable Thermostat. HOLDS APPROX 205 x 330ml bottles PD110T. 600mm wide : 1820mm high : 515 mm deep. From John O' Groats to Lands End.... We reach the parts, that others fear to trade! Please Check before ordering if Next Day service is available in your Postcode Area... The item "PD110T NEW SINGLE DOOR BACK BAR BEER WINE COOLER BOTTLE FRIDGE FREE DELIVERY" is in sale since Sunday, June 18, 2017. This item is in the category "Business, Office & Industrial\Restaurant & Food Service\Refrigeration". The seller is "slyth123" and is located in Harlow ,Essex . This item can be shipped to United Kingdom.